“Rushlimbaugh is a threat to Indians”, remarked my wife in a mildly caustic tone, as she put down the phone. She was talking to my sister-in-law who lives in Indiana. I was too engrossed in reading ‘The Greatest Spy Stories of the World’ to pay any extraordinary attention to her abrupt statement. I thought she said something about some Rushlimbaugh emerging as a threat to Indiana or Indianapolis or whatever. But, like all smart men, I was careful not to be caught napping. But honestly, I didn’t have the faintest idea of what Rushlimbaugh was. Funny sort of name! Rushlimbaugh..!! A few possibilities crossed my mind. Possibility # 1: That Rushlimbaugh was a variety of poultry, quite like our own Arambagh chicken. 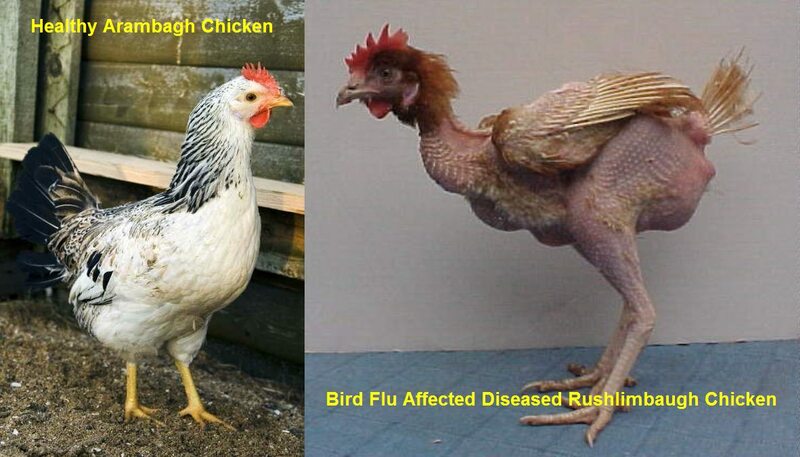 Somehow, this Limbaugh chicken had contracted the dreaded Chinese bird flu, and the people of Indiana, including my sister-in-law were suddenly left with eggs stuck in their throats. Possibility # 2: That Rushlimbaug was some sort of a wild animal, like the ringtailed civet or the coyote, that had the cheek to attack the people of Indiana when they were comfortably reading their newspapers while squiggling in the toilet. Possibility # 3: Or, could it be the latest cyclone to hit the US of A? After all, they’ve had quite a few of the nasty ones in the recent past. Perhaps ‘Hurricane Rushlimbaugh’ was building up ominously over the Atlantic? Maybe Rushlimbaugh was a huge and pompous mass of gas with a little hole in the centre that screwed everything crossing its path? Something which I’d like to call a complete gas-hole! 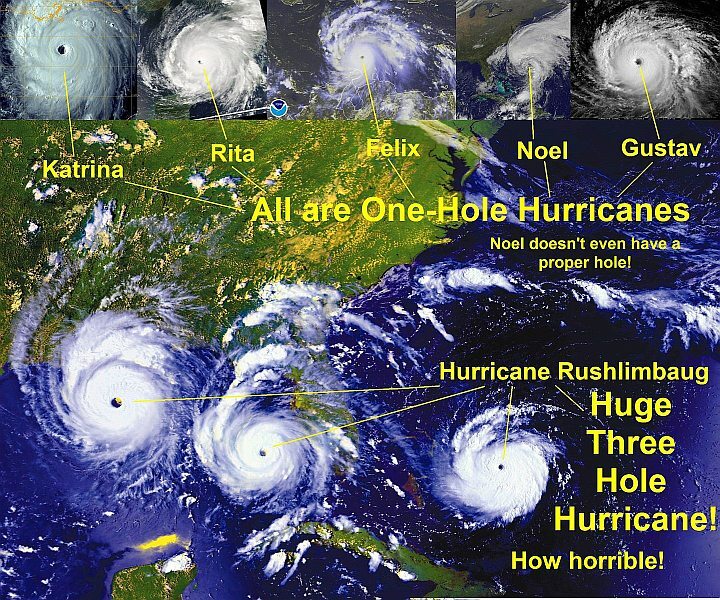 I closed my eyes and tried to visualize the buxom Mary Ramos of CNN cheerfully sticking a finger at the centre of the cloud mass, comparing the dimensions of Hurricane Rushlimbaugh’s hole with holes of other distinguished typhoons like Katrina, Rita, Felix, Noel and Gustav. Poor Americans. Every now and then they have to suffer one of these catastrophies. And look at the mess they cause. Smashing up trucks, shoving cows up electric poles, flattening banks on Wall Street, throwing Republicans into Cuba, screwing up Presidents ….. appalling! I put the book down and reached for the laptop. I was now determined to find out what Rushlimbaugh was and why was he considered a threat to Indiana. 7 Comments on this article. Feel free to join this conversation. I was compelled to think like Mumbai has an Alibaug, Indian has an Rushlimbaug. But looks like it is something from a big hole of fame. Looking forward to the continudity. Alibaug did cross my mind. But Arambagh has a greater general appeal about it! Monica was more than a hurricane…remember the way she uprooted all poles? One of these days they should have a hurricane named Sarah Palin! your post was much better than the google results! I’m gonna call every A-hole “Rushlimgaugh” for the whole of next week!